The Mont Pelerin Society was founded in April 1947, after a meeting of liberals, in the classical sense, which Friedrich A. von Hayek had called at the Mont Pelerin (Pilgrim Mountain), near Montreux, in Switzerland. Those present included Frank H. Knight, the founder of the Chicaco School of Economics, Ludwig von Mises, the acknowledged leader of the Austrian School of Economics, Austrian-English philosopher Karl R. Popper, Italian economist Luigi Einaudi, President of Italy 1948–1955, German economist Wilhelm Roepke, French philosopher Bertrand de Jouvenel, French economist Jacques Rueff, an adviser to General Charles de Gaulle, his compatriot Maurice Allais, who was later to receive the Nobel Prize in Economics, and two American economists, Milton Friedman and George J. Stigler, both to become Nobel Laureates. 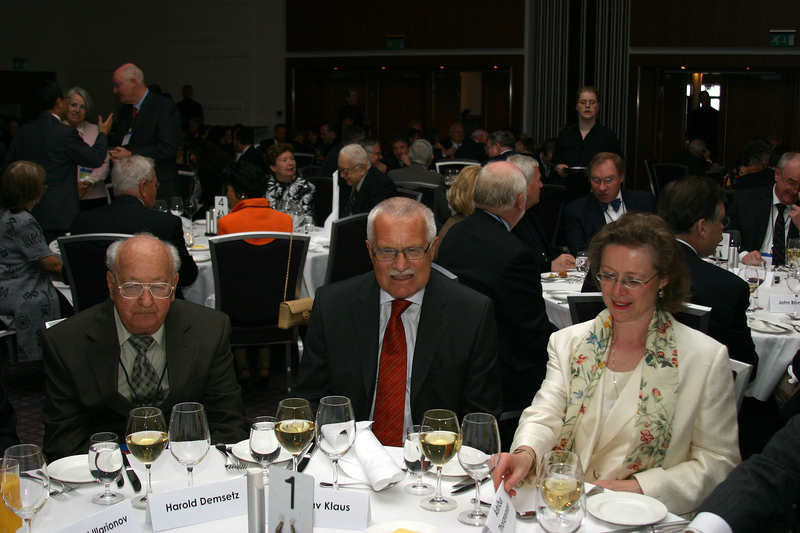 The Mont Pelerin Society Regional Meeting in Iceland, August 2005. From left: Harold Demsetz, Vaclav Klaus and Astridur Thorarensen, the wife of then Foreign Minister David Oddsson. The Mont Pelerin Society was conceived as an international debating club rather than as a purposeful movement: It provided a biannual opportunity for friends of liberty to meet to exchange and to develop ideas. Hayek was President of the Mont Pelerin Society until 1961, and later Presidents included Milton Friedman, George Stigler, Nobel Laureate James M. Buchanan, the Italian economist Antonio Martino, former Foreign Minister and Defence Minister of Italy, and Nobel Laureate Gary S. Becker. Two other members of the Mont Pelerin Society have received the Nobel Prize in Economics, Ronald Coase and Vernon L. Smith. The present President is the renowned monetary economist Allan Meltzer, Professor at Carnegie Mellon University and the author of the definitive history of the American Federal Reserve System. Some prominent politicians have been members, including Chancellor Ludwig Erhard of Germany, President Vaclav Klaus of the Czech Republic and Prime Minister Mart Laar of Estonia. Professor R. Max Hartwell of Oxford University has written the history of the Mont Pelerin Society. 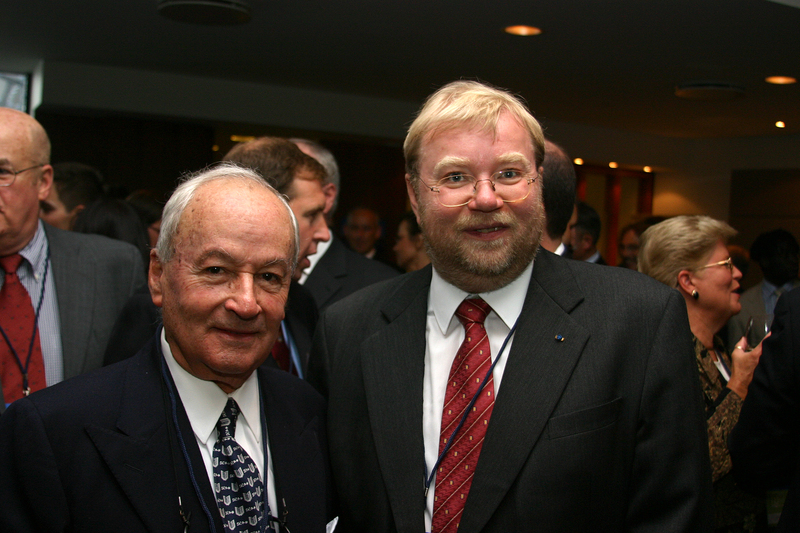 The Mont Pelerin Society Regional Meeting in Iceland, August 2005: Manuel Ayau from Guatemala and Mart Laar from Estonia. The Mont Pelerin Society held a regional meeting in Iceland in August 2005 on “Liberty and Property in the 21st Century”. Professor Harold Demsetz was chairman of the programme committee, while local organisation was handled by Professor Hannes H. Gissurarson and Fridbjorn Orri Ketilsson. The Icelandic speakers at the meeting were Birgir Thor Runolfsson, Professor of Economics, Foreign Minister David Oddsson, Hannes H. Gissurarson, Professor of Politics, Dr. Kari Stefansson, Director of Decode Genetics, Ragnar Arnason, Professor of Economics, and Thrainn Eggertsson, Professor of Economics. Other speakers included Mart Laar, Professor Arnold Harberger of Chicago and UCLA, and Vaclav Klaus. Topics like property rights to fish stocks, to whale stocks, to human genes and to the radio and television spectrum were discussed, with many other issues. In their free time, conference attendees went on excursions to the Blue Lagoon and to the ancient parliamentary site of Thingvellir. Professor Hannes H. Gissurarson is the only Icelandic member of the Mont Pelerin Society. He sat on its Board of Directors in 1998–2004. The 2012 general meeting of the MPS was in Prague 2–7 September, five representatives of RNH attending, Professor Gissurarson, Gisli Hauksson, the Chairman of the RNH Board, Fridbjorn Orri Ketilsson, Thorunn Gunnlaugsdottir, and Asgeir Johannesson, the chairman of the Icelandic Ayn Rand Society. Professor Gissurarson also attended the 2013 MPS regional meeting in the Galapágos Islands in June. Several representatives of RNH will attend the 2014 general meeting of the MPS in Hong Kong in August and September. While there is no formal relationship between the Mont Pelerin Society and Liberty Fund, Indianapolis, many people in both organisations share the same liberal ideals of discussion and debate with an open mind, in the spirit of exploring rather than preaching. Liberty Fund has held three colloquia in Iceland about the Icelandic sagas, of which Liberty Fund’s founder, Pierre Goodrich, was an admirer. The Saga of Burnt Njal was one of his recommended books to read, and Snorri Sturluson one of his favourite authors. Professor Hannes H. Gissurarson served as the executive director of all three colloquia. The first colloquium was at Thingvellir, the second one at Reykholt and the third one in Reykjavik.